Crisis in the Global Economy is the latest and most innovative collective reflection on the state of global capitalism, developed in the mobile “multiversity” of the UniNomade network of international researchers and activists during the months immediately following the first signals of the current financial and economic crisis. 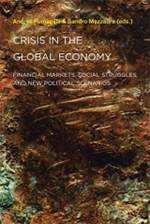 It constitutes the first organic and interdisciplinary attempt to analyze a crisis that is not merely financial in nature but implicates globalization and neoliberal capitalism. Crisis in the Global Economy begins with the recognition that the current financial crisis is a systemic crisis of the entire capitalistic system as it has been developing since the 1890s. Taking as its premise that today’s financial markets are the pulsing heart of cognitive capitalism, financing the activity of accumulation, Crisis in the Global Economy shows how the flow of capital rewards production that exploits knowledge and controls spaces beyond traditional business. The ineffectiveness of the extraordinary economic measures taken by single nation-states over the past few months demonstrates that this crisis is of a completely different order. A financial crisis that affects the “real economy” shows that financialization is one of the most recent and perverse articulations of capitalism. The contributions to Crisis in the Global Economy invite us to consider exit strategies from the current crisis—strategies that may lead us toward a new horizon of constructing the common. Andrea Fumagalli is Professor in the Departments of Political Economy and Economics at the University of Pavia. Sandro Mezzadra teaches in the Department of Political Science in the University of Bologna.